Holland Bloorview Kids Rehabilitation Hospital (formerly Bloorview Kids Rehab) is Canada’s largest children’s rehabilitation hospital. Our vision is to create a world of possibility for kids with disability. Watch Sheila Jarvis discuss the impact the RNAO's Nursing Best Practice Guidelines have had at Holland Bloorview Kids Rehabilitation Hospital. Watch Kelly Falzon talk about the impact the RNAO's Nursing Best Practice Guidelines have had at Holland Bloorview Kids Rehabilitation Hospital. Doris Grinspun recognizes RNs at Holland Bloorview Kids Rehabilitation for adopting the clinical best practice guidelines. Nick Joachimides, a registered nurse who uses RNAO’s pain management best practice guideline talks about how it helped one of his patients. 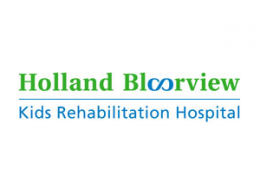 Hear Thomas Schneider, patient, talks about the positive impact the care at Holland Bloorview Kids Rehabilitation Hospital has had with implementation of RNAO's Nursing Best Practice Guidelines.